Nickel is distinguished by a silver-white color possessing a slight golden or yellow hue that can be plated to a dull or bright finish. Nickel plating can be decorative, provide corrosion resistance, wear resistance, an underplate for chrome and provide lubricity. 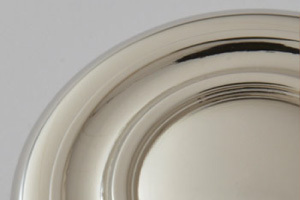 For engineering purposes, Nickel plating is often smooth and has a dull grey appearance. Dull Nickel is beneficial for wear resistance, hardness, lubricity, and magnetic purposes. Bright Nickel is mainly used for its smooth mirror-like finish and decorative value because the brighter the deposit gets the less ductile it becomes. Nickel is frequently applied in the chemical, petroleum, and food and beverage industries to prevent corrosion, maintain product purity, and prevent contamination.